It was St. Patrick's Day in 1997. I was taking a walk and passed 'The Yuppy Puppy'. She was in the window, a Miniature Schnauzer with the face of an angel. She came home with me and we enjoyed twelve years of pure joy. When my only child grew up and moved on to college, I didn't cry because I had Casey and she was the truest companion I could ever have. Casey was the original Cookie Monster. If you said "Cookie" she would come running from the farthest reaches of the yard. A cookie was all it took to make a perfect day! The day before Thanksgiving 2008, Casey just didn't seem right. We took her to her vet and between Thanksgiving and Christmas of 2008, she was diagnosed with mammary cancer. I was devastated. Casey passed on February 19, 2009. She took a piece of me with her. At the end of March 2009, my husband insisted we see a breeder and raise a new Miniature Schnauzer. Cali then became a part of our lives. 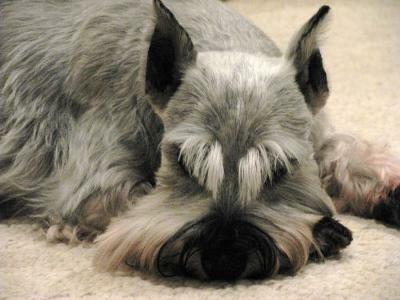 Casey was so perfect you see, the absolute best, that we couldn't bear to live without a Miniature Schnauzer. She was a credit to her breed and will live on in our hearts always. What a lovely dog and she was fortunate that you saw her in the window and took her home for 12 years. She returned her love that you gave to her. She is glad you have Cali to help watch over you as we all know Cali was never a replacement. Casey can never be replaced and she is always in your heart and mind and will never be forgotten. You gave her all that a little doggy would want. Daddy told me once that god watches over those who take care of animals. Casey truly has a face of an Angel. I'm glad you had 12 blissful years together and I'm happy you have Cali in your life today.